“…over 150, 000 Aboriginal children were taken from their families and sent to residential schools. The result of the physical and emotional abuse suffered by so many continues to impact future generations.” Carol McDougall writes of this in the Author’s Note at the end of her book, Wake the Stone Man, the well-deserved winner of the 2013 Beacon Award for Social Justice Literature. Set in a small northern town, under the mythical shadow of the Sleeping Giant, Wake the Stone Man follows the complicated friendship of two girls coming of age in the 1960s. Molly meets Nakina, who is Ojibwe and a survivor of the residential school system, in high school, and they form a strong friendship. As the bond between them grows, Molly, who is not native, finds herself a silent witness to the racism and abuse her friend must face each day. In this time of political awakening, Molly turns to her camera to try to make sense of the intolerance she sees in the world around her. Her photos become a way to freeze time and observe the complex human politics of her hometown. Her search for understanding uncovers some hard truths about Nakina’s past and leaves Molly with a growing sense of guilt over her own silence. When personal tragedy tears them apart, Molly must travel a long hard road in search of forgiveness and friendship. When I heard what this book was about, I wanted to read it. But, I was worried that the story was going to be heavy and hard to read. It wasn’t at all. It is a serious and sensitive topic, and I shed some tears (is anyone surprised? ), but there is also compassion and warmth. Carol McDougall has written a story that is engaging and readable from beginning to end, and appealing to a wide audience. Which is good news, because it is the kind of book that everyone should read. There was so much I didn’t know. So much I never asked. I should have asked. The story of Molly and Nakina, is about racism and abuse, shame and grief, but also about love and forgiveness. These are things we can all relate to. But, McDougall takes it a step further; behind the scenes there is the horror of the children being taken from their families and sent to schools where they were ridiculed and abused. As Molly searches for forgiveness from Nakina and from herself, we can’t help but wonder about all the children and families who haven’t found it yet. When I looked through the lens everything stopped – and in that suspended moment everything, no matter how small or ordinary, seemed beautiful. Everything seemed important and connected and necessary. Every person mattered. 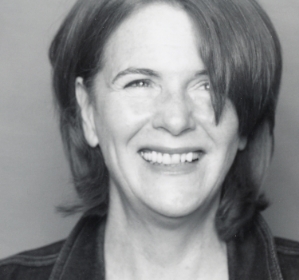 Carol McDougall was kind enough to answer some questions for me about her book. Her answers are thoughtful and eloquent, and I urge you to read every word. Then go read her timely and important book! 1. The Stone Man plays a big part in your book; Molly grows up under its shadow, and it later shows up in her art. Can you tell us more about The Stone Man and the significance of the title Wake the Stone Man? Living in Thunder Bay the Sleeping Giant is omnipresent and dominates the landscape. The Stone Man, or Sleeping Giant, a rock formation that rises out of Lake Superior to form the shape of a man lying across the Thunder Bay harbour. When I fly back to Thunder Bay and the plane begins to descend over the harbour, I watch to see the form of the Stone Man rising out of Lake Superior and it brings tears to my eyes – it is like seeing an old friend. Growing up in Thunder Bay the Sleeping Giant was a real living figure for me, and I wanted to bring that into the novel. It is also an important figure in Ojibwe mythology. Nanabijou, the Spirit of the Deep Sea Water wanted to reward the Ojibwe people, and gave them knowledge of a great silver mine. He made them promise to keep this knowledge secret from the white man and told them that if they were ever to divulge this secret then he would be turned to stone. In the legend an enemy Sioux scout found the mine and divulged its location to white traders. A terrible storm broke out on Lake Superior, and when the waters calmed there was great death and destruction and Nanabijou lay across the harbor turned to stone. The title Wake the Stone Man speaks to waking that primal spiritual force – raising him out of the waters of Lake Superior to bring healing and harmony back to the people. 2. What did your writing process look like for this book, from beginning to end? And, what was your inspiration for this particular story? Wake the Stone Man was inspired by my childhood friend who was Ojibwe and a survivor of the Residential School system. It was from her that I first learned of the cultural genocide and horrific abuse against First Nations children in the Residential School. Wake the Stone Man is fiction, and my friend’s life is very different from Nakina’s story, but it is from that friendship that the seed of the novel grew. Like most writers in Canada, my writing life is woven into my working life. I write each day on the Halifax ferry on the way to work, and during my daily walks I think about the novel and work out different scenes. Walking for me is like a meditation, and I find that when my mind is still the story becomes clear and I can hear the characters speaking to me. I have the good fortune to live above a wonderful coffee shop called Two if By Sea, and early Saturday and Sunday mornings I settle into my favorite table and write. For some reason I am able to shut out the bustle around me and get lost in the writing. Once I began writing Wake the Stone Man it took on a force of its own, an urgency to be told. I began by knowing the heart of the story I wanted to tell, and the last line of the book. Everything in between evolved from that. There is a mysterious force which takes hold once I’m lost in the writing – the characters begin to talk and take the story forward themselves. When I’m in that magical place I let the story flow through me and feel I’m more listener than writer. I listen and when it sounds true I let the story flow, and when it sounds forced and artificial I stop. It’s almost like listening to music – you can hear when the notes are right and when they are off key. The writing in Stone Man is very spare and pulled back. This is very deliberate. I wanted to bring the reader face-to-face with the characters in a very raw, real, immediate way. I wanted the reader to feel they were connecting directly to the characters, so that the emotional impact of the novel wasn’t filtered through the authorial voice. To achieve this I wrote thousands of pages of text and then whittled it back to find the true solid shape of the story. 3. Molly witnesses her friend Nakina, who is Ojibwe, face racism and abuse. When they are young, she doesn’t seem to know what to do about it, but later it haunts her. Part of this story is Molly’s search for forgiveness. Taking a look at the big picture, there is a search for reconciliation for all those people who have been either directly or indirectly affected by the residential schools. When I think about this situation, I feel at a loss. How do we get beyond that feeling of helplessness, and move toward a reconciliation? That is a very important question. I think the most important thing is that the process of reconciliation must include all Canadians – native and non-native alike. The website for the Truth and Reconciliation Commission http://www.trc.ca has a wealth of information for all Canadians on how to become involved in the process. The closing events for the TRC will take place May 31st to June 3rd in Ottawa and I would urge anyone in the area to take part in the walk for reconciliation and the many events planned. I would love to see the history of the Residential School system on all high school curriculums. Young students learn much about conflicts in other countries but they should know about this dark chapter of their own country’s history. Knowing the truth can help shift attitudes and actions. I think books like Wake the Stone Man and the many extraordinary books written by First Nations authors about the Residential School system make excellent Book Club reads as they provide an opportunity for groups of people to gather and reflect and discuss this part of Canada’s history. 4. 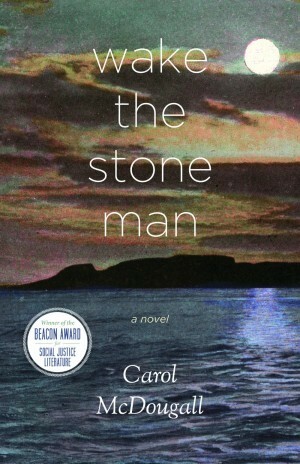 Wake the Stone Man (deservedly) won The Beacon Award for Social Justice Literature. What are your thoughts on the importance of reading and our awareness/understanding of social issues? Do you ever feel like most people who read books about important issues are already interested in these issues (like preaching to the choir)? What can we do to get more people reading them? Ahh – the power of reading is something I feel very passionately about. I believe that through reading we learn empathy, compassion and knowledge which helps us navigate through life and make more informed choices. In my day job I head a program in Nova Scotia that gives free books and reading resources every new family as soon as their baby is born. I have given out over a quarter of a million free books with the message that reading and literacy are every child’s birthright. I believe reading makes us more human. 5. What is the message you would like to see your readers get out of your book? The hope of redemption and reconciliation is what I would like readers to take away from Wake the Stone Man. I think there are times in all our lives when something has been lost or broken and we feel there’s no way to make it right. I believe there’s always a chance for redemption and healing. It may not come when we want, or how we expect, but it can happen. There is always hope. 6. What have been your literary influences over the years? Were you influenced by any in particular during the writing of your book? Many of my strongest literary influences are tucked into Wake the Stone Man. Readers can find Leonard Cohen, Harper Lee and the lyrics of Bob Dylan. Sheila Burnford who wrote the Incredible Journey actually did have a cottage beside ours and when I was a young girl I would watch her sitting at a small table on her dock typing and think maybe some day I could be a writer. Kurt Vonnegut and the Canadian playwrite George Ryga who wrote the Ecstasy of Rita Joe are also woven into the novel. In these literary influences I found the magnificence of language, the emotional power of story, the mastery of structure and narrative shape and the power of words to carry political messages. 7. Do you have plans for any new projects in the future? When you finish a novel there is a strange silence. The characters you’ve lived with inside your head for so long are now out on the page and finding their way in the world. I’m anxious to jump into a new novel and have been tossing around a few ideas. At the moment I’m waiting to see which voices speak to me the loudest. Thank you to Carol McDougall for agreeing to an interview, and to Roseway Publishing for sending me a copy of her book. I will be watching closely for her next one! This sounds like the kind of book that would resonate with Australian readers as the story has echoes of the Stolen Generation in which aboriginal children were forcibly removed from their families and adopted out to white people or kept in orphanages. The nice thing about this book, too, is that the themes are wide-ranging and ones that most of us have all come up against in some area of our lives. Sadly the book doesn’t seem to be available in the UK. I put this one on my list. I’m so excited about Carol’s new book and I’m looking forward to her launch on Sunday. Thanks very much for this conversation, Naomi and Carol! What thoughtful questions and insightful answers. I love to read about an authors inspiration and writing habits. This sounds like a very important book. This is another book that sounds wonderful, but is not available in the US. Gah! It’s too bad, because it sounds like McDougall did a great job tying local history and legend into her book. I loved reading her answers to your questions. It’s pretty new, and the publisher is small, but it might eventually get there. I hope so! Yes, she grew up next to one of the Residential Schools, and remembers it being torn down. She also had a friend who was Ojibwe, and living in the shadow of the Stone Man, she would have heard the legends and stories as she was growing up (the good stories and the bad). From what I can tell, this story had been sitting with her a long time before she finally got it out in book form. Great review and such an insightful interview with the author! I am quite fond of the Thunder Bay area and it would be interesting to read about these legends. I had never heard of the Sleeping Giant/ Stone Man, so it was interesting to read about the hold the legend has on the people in the area. And, it made me want to visit!